Known for their outstanding members — and their distinctive sartorial style — this group represents one of Seattle Pacific’s longest-standing student organizations. Do you know the group’s name? 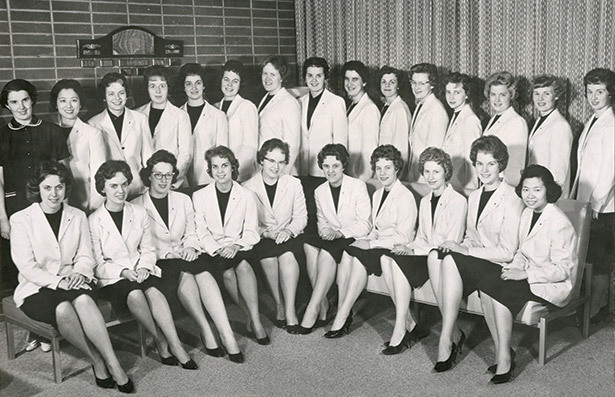 And can you name their faculty advisor, pictured at the far left? Send in your answers by December 22, 2014, and you will be entered into a drawing to win an SPU sweatshirt! Contact us at response@spu.edu with your answer. 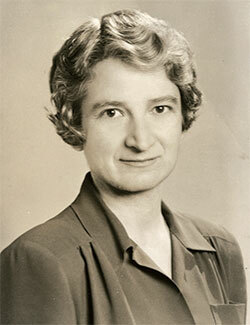 Many readers wrote in to identify Winifred Weter, who not only served Seattle Pacific as professor of classical languages for 40 years (1935– 75), but also became the first woman to coach a Seattle Pacific athletic team — basketball. Congratulations to our contest winner, Thomas Gaines ’74! Read more remembrances of Winifred Weter. Do you recognize the group above or their faculty advisor? Send in your answers by December 22, 2014, and you will be entered to win an SPU sweatshirt!